An Integrated Circuit tester (IC tester) is used to test Integrated Circuits (ICs). We can easily test any digital IC using this kind of an IC tester. For testing an IC, we need to use different hardware circuits for different ICs; like we need a particular kind of tester for testing a logic gate and another for testing flip flops or shift registers which involves more complication and time involved will also be more. So here’s an IC tester to overcome this problem. Unlike other IC testers, this is more reliable and easier since we don’t need to rig up different kind of circuits for different kind of ICs, each time we need to test them. Unlike the IC testers available in the market today which are usually expensive, this IC tester is affordable and user-friendly. 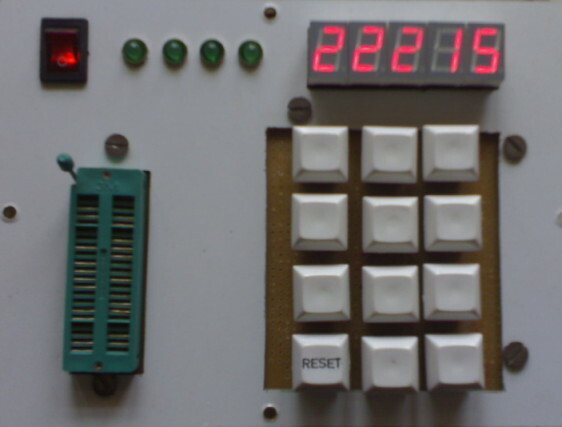 This IC tester is constructed using 8951 microcontroller along with a keyboard and a display unit. It can test digital ICs having a maximum of 24 pins. Since it is programmable, any number of ICs can be tested within the constraint of the memory available. This IC tester can be used to test a wide variety of ICs which includes simple logic gates and also sequential and combinational ICs like flip-flops, counters, shift registers etc. 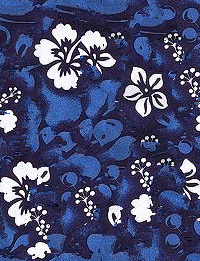 It is portable and easy to use. 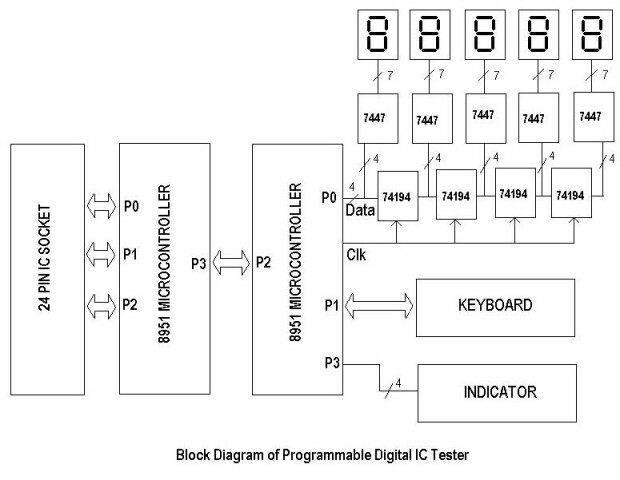 The block diagram of the programmable digital IC tester is as shown in below. 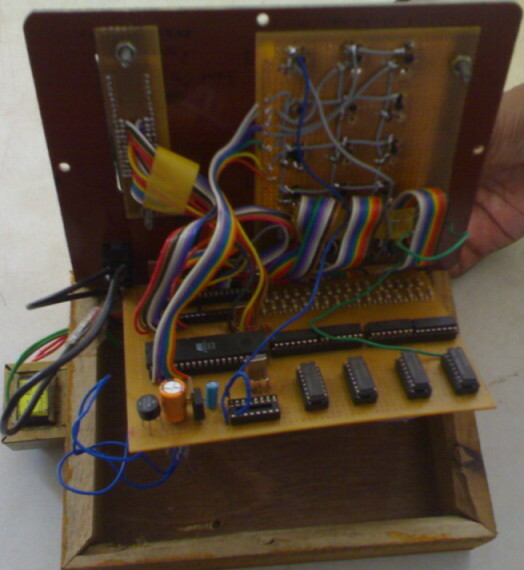 It consists of two 8951 microcontroller ICs, a 24-pin IC socket, a keyboard unit, a display unit and indicators. To test a particular digital IC, one needs to insert the IC into the IC socket and enter the IC number using the keyboard and then press the “ENTER” key. The IC number gets displayed in the 7-segment display unit. Four LEDs are provided as indicators. If the IC being tested is a logic gate, then each of the 4 indicator LEDs correspond to the 4 gates of the IC. In any other case wherein the inserted IC is not a logic gate, all the 4 LEDs work as a single indicator.